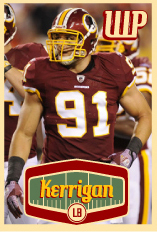 Should the Redskins bring him back? Because of the injuries to Crowder last season and the underperformance of the entire WR unit is it worth bringing back Garcon ? He's already familiar with Gruden's system...he's 32 years old but he can still play. Like us to draft a WR as well as add a John Brown, DJax type-vet on the outside WR. If his price goes low enough absolutely, I just don't think it will go low enough to make sense for us. I wouldn't pay more than $2M or so per season at this point. Not staying healthy enough. I doubt Garcon would even want to come here due to our QB situation.. I imagine Garcon will want to go to a contender team to have a chance to get a SB ring before he retires. Skins moved on at just the right time from Garçon. True, he has only played 8 games (16 total) in the last two years. And had 1 TD. No. We need someone fast who can stretch the field. Garcon was never that player in his prime and he certainly isn't now. Garcon will be 33 when the season starts. If there is a need at WR, look to the draft. By NFL standards, it is cheap labor with growth potential. The 2019-2020 vet minimum for a player with 10+ years is approx $1,045,000. However, if Washington picks a WR in say, the 3rd round, his salary is $743,573. He supposedly has tailed off drastically and has trouble staying healthy, I'll pass. really? Doctson has been more productive the last two years and his contract was about 75% lower than Garcon. Doctson has been so disappointing that I would take a 50/50 Garcon over him. Garcon missed half of the last 2 seasons but on a per game basis, he is far more productive than Doctson. Doctson is averaging 35 yards a game and has never had a 100+ yard receiving game. he isn't a starter in this league. He can't break tackles and doesn't go over the middle. It's time to move on from him. Paul Richardson is the only veteran WR we should bring back. We need to see what the young guys can do.